I was already feeling woozy and disoriented when we arrived in Kathmandu, Nepal. The long layover in Qatar and the 4:30 a.m. departure time meant that I had been on the move for the last 30 hours. Exhausted and in a sore need of a shower, all I wanted to do was to crawl into a clean bed (although I wasn’t going to be too picky) and sleep. My fellow passengers dashed past me lugging enormous bags in their mad rush to disembark. (How they got these bags past the carry-on limits is still a mystery to me.) I would later learn from the hotel manager that many Nepalese work abroad, especially in the Middle East, to provide for their families. Opportunities and money are hard to come by in Nepal, especially after the 2015 earthquake. Most worked service jobs, which meant they could only afford to come see their families every few years. I could hardly begrudge them their haste. After navigating immigration and customs, we entered a new world. We had come from the European leg of our around-the-world trip with the last stop being Helsinki, a neat Scandinavian city where trains ran on time and stores closed at 6 p.m. sharp. Nepal was nothing like anything in Europe. Cars and motorbikes were everywhere, the only discernible organizing principle being vehicles staying on the left side … mostly. Pedestrians weaved in and out of traffic. The smell of diesel filled the air thanks to the aforementioned cars and motorbikes. It was downright cacophonous with people shouting, trying to be heard over the car honks and the speeches of the motorbikes. My fatigue forestalled any panic or anxiety on my part. I was too tired to take much notice of the fact that a motorbike nearly ran over my white cane. I remained unaffected even as the taxi slowly made its way through the gridlock that was Kathmandu traffic. Exhaustion does wonders for one’s nerves. As someone who is Deafblind, I don’t necessarily have the best relationship with chaos, particularly the audiovisual type. Ever since my sight began fading in earnest in 2013 due to retinitis pigmentosa, I’ve become easily frazzled by commotion. Having blurry, distorted vision gives you just enough perception to see what’s coming, but not quite enough to feel as if you can avoid it. My cochlear implants don’t necessarily orient me any better. Their pixelated and auto-tuned representation of sound serves well enough to understand spoken language and discriminate familiar environmental sounds under controlled conditions. They, however, don’t provide sufficiently nuanced hearing that would help to orient me. (Echolocation is impossible.) This results in both limited vision and hearing. This meant that whenever I venture into the disorganized, messy world, unidentifiable and distorted images and sounds inundate me. In the first year after my central vision began to blur, I found this experience bewildering. I would often step backwards, startled by what looked like someone approaching but was only a shadow from a passing car. I did grow accustomed to a world full of strange flashes of light and noises without a clear source that I could go out without reacting to my misinterpretations of the moving lights and shadows. I learned to focus on what I knew were real: the tactile feedback from my white cane, the map that I had studied, and the few sounds and sights I could identify. I, however, remained uncomfortable. I gritted my teeth and braced myself whenever I went outside. Along with the disorientation came some fear. I trusted people — especially drivers — far less now that I couldn’t see or hear them clearly. Chaos and I weren’t on the best of terms. When I woke up from my much-needed nap, we both walked outside with alert minds. What we encountered was much what had been there before. This time I could appreciate the full force of the chaos. I became disoriented almost immediately. In a city of over a million people and several hundred thousand vehicles, there isn’t a single traffic light in Kathmandu. The absence of any traffic control meant that everyone is out for themselves. One glance at Kathmandu traffic shows how individual optimization creates a horrible logjam for everyone. Cars got stuck turning left at intersection because nobody would let them through, blocking dozens of other vehicles behind it. The only reprieve from this mess was when a few generous souls stood up during rush hour and direct traffic at intersections. To a delicate and sheltered Westerner such as myself, this whole scene seemed rather impossible. This is the true definition of chaos, I thought. How do people deal with this? How will I deal with it for that matter? My first lesson in chaos came the next day as my boyfriend and I crossed the street. Without any stoplights, we had to simply … cross wherever. The thought of stepping out into the floodwaters of traffic quite terrified me as I watched flashes of white and black zip by. But there was no other way. We took our first steps together and a car skirted us quite neatly and nimbly. Then we inched forward, one step at a time. The traffic simply flowed around us, as if we were a rock placed in the middle of a rushing stream. We reached the other side of the street a bit dustier, but very much alive and unharmed. The more streets we crossed and the more we came away unscathed, we began to see a method in the madness. 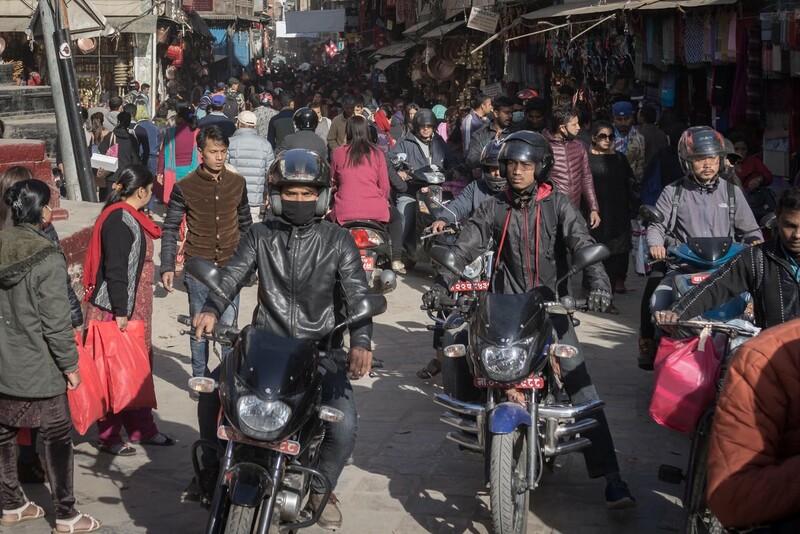 Amid the tumultuous Kathmandu streets, it can feel to the pampered Westerner like it’s a cutthroat world where nobody has any regard for anyone else’s safety. The scams that run rampant here don’t help ease this feeling. This isn’t true at all. Nobody truly wants to hurt you (although many wouldn’t mind some of your money). As long as you don’t act unexpectedly — such as taking a step backwards while crossing, a major no-no — and with enough warning, motorists will avoid you. They don’t want to crash into anyone and will take measures to ensure your safety. Once I realized this, I felt .. oddly comfortable crossing the streets in Kathmandu as well as Bangkok, Hanoi, and Siem Reap. Basic human consideration for others’s safety survives — perhaps even thrives — amidst chaos. There are little ways that we all look out for each other. A Nepalese driver told us that he honks as a friendly warning to pedestrians, a “You-hoo! I’m coming, so would you pretty please move aside?” A Vietnamese biker wiped out on the rain-slick streets of Hanoi because he was trying to avoid hitting me. It is too easy to forget about basic human consideration if you live in a regimented country where most human interactions on the road are regulated by stoplights and signs. This isn’t to say that Nepal and other countries that have similar chaotic transportation system are enlightened places where everyone holds hands and sings. There were careless drivers who nearly sideswiped me, bikers who rode on the sidewalks to avoid traffic with little regard for others, and so on. The lack of organized infrastructure also hinders the independence of the visually impaired. I’m not sure if I could’ve gotten much further than the front door if I hadn’t been with my sighted boyfriend The blind people I met in Nepal said that it’s a tough place to be blind, as there are few allowances for the visually impaired and even fewer people are willing to help. Chaos can be unforgiving. My time in Nepal, Thailand, Vietnam, and Cambodia — all places where noise and movement are the biggest constant — seems to have inoculated me to chaos. I no longer cringe when I go outside in the relatively pristine and orderly United States. I’ve grown even more thankful for those nifty stoplights with audible and vibrating signals that enable me to cross streets quite independently (and confidently). Chaos and I aren’t exactly friends quite yet. We’re getting to know each other better, though.